Biology/Life Cycle: Tumblebugs roll manure into balls as large or larger than themselves. Female adults lay eggs in the balls and bury them to supply food for the larvae. Some adults dig burrows below the dung piles. 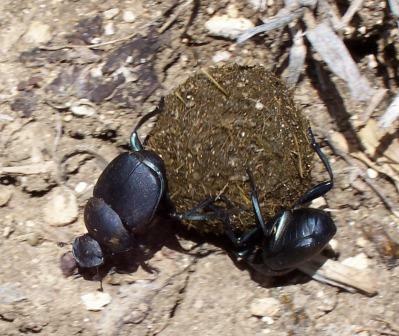 Most dung beetles roll the dung in balls some distance from the piles. A single egg is laid in each dung ball. The larvae hatch and feed to the manure. The male helps in preparing the nest for the larvae. This is the only known case among insects where the male aids in providing for the young. Note: We have learned from outside sources that Dr. Fincher was ordered by the USDA brass to discard all his experiments on dung beetles during the Ronald Reagan years because a big pharmaceutical company, that makes pest control products used on animals to control flies and parasites, complained that his work was interfering with their profit projections. Here is a report of a field trial.